#AuntyGoals – Kendall Jenner proved that creativity trumps cash when it comes to gift giving after the clever and cute prezzie she gave niece North West for her 4th birthday was revealed. Kim Kardashian’s video “tour” of daughter North’s present from Kendall shows just how much trouble she went to hatching the perfect present for her niece. For those Kardashian-challenged, but keen to play along, Kendall Jenner is Kim Kardashian’s younger sister. North is Kim’s daughter with musician Kanye West. The pair have a toddler son, Saint, too. Not only did Kendall buy North a really great Smithsonian Maker Lab book chock-full of experiments and fun things to do (and let’s face it, we need to encourage girls to pursue adventures in science and maths), but she pored over the book and made sure North was all set to get science-y! “I’m posting Kendall’s gift to North because it’s just so creative and I think it’s so cool,” Kim says in the clip. 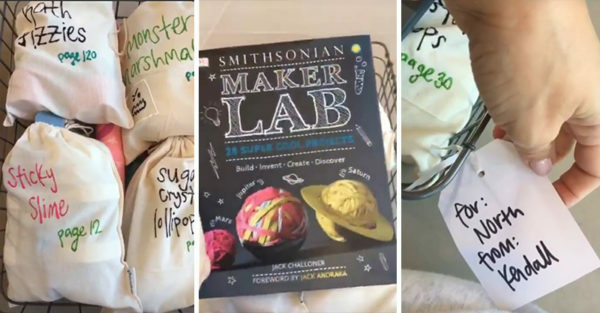 “She picked out this science book, then she picked out her four favourite projects inside of the science book, and then packed each one with all of the ingredients,” she goes on. Kim explains that Kendall bagged up each project separately, with the project name and page written on each bag, and all the materials required to make that project tucked inside. Kim then pans the camera over each project and waxes utterly lyrical on the thoughtful and genius-nature of the gift, apologising for her enthusiasm with a final “Sorry I just love this!” as the video ends. Gosh. I mean… We love this too! Not only is it a clever and fun idea, a whole bunch of thought has gone into it AND it’s an invitation to get messy and explore something that could lead to much bigger science-based things. If you’ve ever watched anything Kardashian, you’ll know that things are pretty neat and tidy and non-science-y at their place, generally. This cute gift could be a game-changer for the family, with Kendall setting the tone for the kind of messy fun we’d love to keep up with! Want to try this at home? You can buy this book at Angus and Robertson Bookworld. And pick up some similar bags locally here. Supplies can be found at your local dollar store, chemist or craft shop. Good luck! Happy science-ing! Thanks Kendall!